“I’m a geek,” Todd Shechter willingly admits, which is not a bad thing when you are the director of information technology (IT) for the College of Engineering. His interest in computers was initially sparked by his first and third grade teacher, Myra Helmer, who was an early adopter of computers and had an Apple II in her classroom. Shechter stuck with his technology passion throughout school, and by high school he was helping to set up the networking for his school’s new Macintosh computers. He started college in Fairbanks, the town where he was born and raised, at University of Alaska. But because they didn’t have a degree in computer science, he did an exchange program to Oregon State University for one year. He liked it so much that he transferred the next year. Starting as a student worker in the computer labs, Shechter has worked his way up through many jobs at OSU and continues to be excited about his work. “I like the challenge. I like that it’s constantly changing. No two days are the same, and we’re always doing new things,” he says. That’s understandable considering he oversees the IT services for all eight branches of engineering including wireless networks, computers, laptops and printers, for both research labs and classrooms. “My job is to be the steering wheel to make sure all the pieces and parts are working together, and that we’re doing good things for our faculty and students. The fun part is to see people using the services that we’re able to support and make their jobs easier,” he says. One of his favorite sights is to walk by full a computer lab where students are set up with their laptop and their lab computer. He also likes to count the number of laptops being used in the atrium of the Kelley Engineering Building. “There are usually over 40 or 50 laptops in just that one space, and it’s pretty cool to see people using the wireless networks and applications we provide to get their school work done,” he says. Todd Shechter isn't kidding when he says he likes to spend time outdoors, even in cold weather. 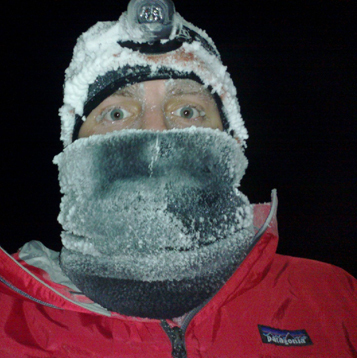 Here he is out on a run on Christmas Eve 2011 in Fairbanks, where the temperature was -43 degrees. Recently, some of the research Shechter supports applied directly to his life. He and his wife were choosing plants for their garden and they used the plant hardiness map constructed from data that is analyzed on one of the servers in his care. “It’s neat to know something that is that so widespread, originated from the data that is crunched here,” he says. He also enjoys work that reaches beyond the university — for example, working in collaboration with other universities to set up a system to legally share documents between researchers at different institutions. “I like to keep us somewhere in middle of leading edge and bleeding edge,” he says. And although an admitted geek, he and his wife also enjoy many outdoor activities. They are avid hikers and backpackers — and even in the cold winters of Alaska — skiers and snowshoers. Shechter is also part of the Corvallis Mountain Rescue Unit. “We perform rescues all over the state, and go far as Mt. Saint Helens in Washington and Mt. Shasta in California. It’s very rewarding to help save someone’s life and get them out of trouble,” he says. His dedication to both his job and his volunteer work has earned him several awards including College of Engineering Professional Faculty of the Year, OSU wide Professional Faculty of the Year, Corvallis Mountain Rescue Unit Member of the Year, Benton County Search and Rescue Member of the Year, and Oregon State Sheriff’s Association Search and Rescue Volunteer of the Year. “Todd is amazing. I don’t think he ever sleeps. He is really in a league of his own — he serves so many and is unbelievably unselfish,” says Terri Fiez, head of EECS. Although he and his wife love to travel and see new places, such as a recent trip to Ireland, most of their vacations are to visit family in California and Alaska. When in Alaska, he still visits his first-grade teacher who started him on his technology path. And he still helps her with her computer.